Lightning is scary enough, but to homeowners with lots of trees, lightning can cause property damage. A lightning strike can cause a tree to fall, crushing anything in its path. If your fence is in its path, you should be covered by your homeowners insurance, minus your deductible. If lightning struck your tree and resulted in damage to your fence, your homeowners insurance will likely pay as long as the tree did not fall due to your own negligence. There are some other exclusions to be aware of, however. Lightning, other weather-related damage, falling objects, vandalism, smoke and explosions are all considered covered perils, or types of losses. So make sure your policy covers falling objects, which includes trees, and you should be covered. You also need to make sure your policy covers other structures, besides your house. This includes fences, sheds, patios, driveways and detached garages; most policies do cover these. You will need to prove that the covered peril – in this case, the tree struck by lightning – fell on the fence. So get photos of the tree on the fence before it is removed. 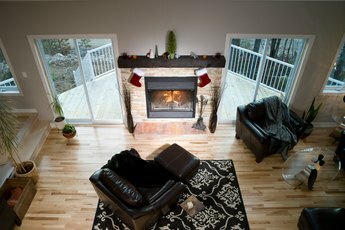 Get photos from as many vantage points as possible. 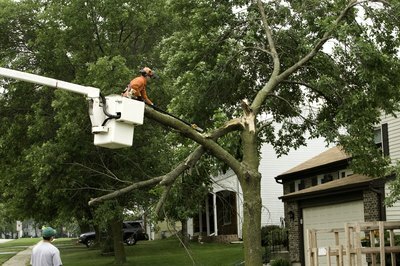 If possible, have your insurance agent visit your property before the tree is removed. Your policy will cover the damage even if the tree is from a neighboring property. You are responsible for any trees that fall onto your property. If your tree strikes a neighbor’s fence, the neighbor’s homeowners insurance should cover their cost to repair or replace the fence. Keep in mind that in both cases, the homeowner is responsible for the deductible. Knowing why a tree fell is key to an insurance company paying for damages. Most insurance companies will pay for damages occurring when lightning strikes a tree, but if that tree was rotting or dying and already in danger of falling, the company will likely not pay and may find you liable for the damage if it was due to your negligence. The same is true if you have a rotting tree that falls on a neighbor’s yard. If an earthquake causes a tree to fall and damage your fence, the insurance company also won’t pay. If your fence was damaged by power lines or a transformer that sparked from a lightning strike, you are not likely to get coverage. 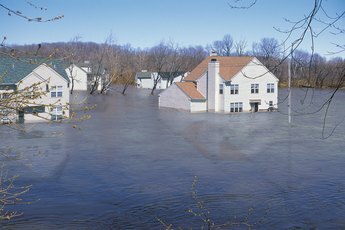 The average homeowner insurance policy does not cover artificially-generated current. Also, a ground surge that damages your fence, or home for that matter, may not be covered. Your homeowners insurance policy will pay damages based on your policy. You will be responsible for your deductible. Your policy may cover either replacement value or actual cash value, or ACV. In the case of a fence, ACV takes into consideration the depreciation of your fence relative to when it was built. If you have replacement value, you will get the full cost of your fence, minus your deductible. In most cases, your policy will not cover removal of tree debris, other than the removal of the branches or trunk from your fence. If there is significant damage, the policy may reimburse you up to $1,000 for removal costs. Homeowners policies often pay to replace trees and shrubs damaged by lightning strikes. So once you have your fence replaced, you may also get a new tree and any shrubs damaged in the fall. But most policies place limits on how much you can recoup in landscaping costs. Quote Wizard: What Kind of Tree Damage Does Homeowners Insurance Cover? Value Penguin: Does Homeowners Insurance Cover Lightning Strikes? Allstate: If a Tree Falls on My House, Does Homeowners Insurance Cover It? Allstate: Does Homeowners Insurance Cover Landscaping Damage? Does Renter's Insurance Cover a Fallen Tree? Does Homeowner's Insurance Cover Water Leaks?